So, early on in CH history I tackled making homemade grenadine which was a real revelation for me. For both of the recipes I whipped up I used Pom juice, which turned out good. Certainly a damn sight better than the store bought stuff. but, I felt there was still something missing. I hadn’t used fresh pomegranantes. Fresh fruits always seem to add a brightness that can’t be obtained with bottled juices. I can’t claim my own lack of fresh ingredients as my only source of inspiration though. I got some inspiration from Rookie Libations via Tiare at a Mountain of Crushed Ice. Chris has the genius idea of adding some hibiscus to grenadine to deepen the redness of the grenadine and add some floral notes. Since my original grenadine recipe called for a tiny addition of orange flower water the additional floral notes in this recipe sounded like just what I was looking for. So, in search of hibiscus I did go. Living in a city centered around fitness and health it was no trouble to find hibiscus last Sunday evening. 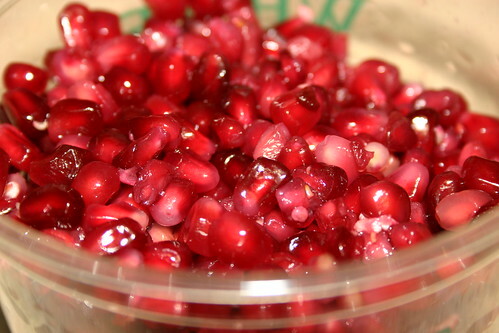 Next up was pomegranates. Both Chris and Tiare used fresh fruits, I on the other hand was leaning towards to the lazy side. When I arrived at Whole Foods and they had pint tubs of pomegranates pips I knew it was made to be. I changed up both Chris and Tiare’s recipes a tiny bit to get the flavor profile I was looking for. 1) Combine ingredients in a non-reactive sauce pan. 2) Bring mixture to a boil. 3) Reduce heat to a simmer and cook for another 20 minutes. 4) Turn off heat and allow to cool for about an hour. 6) Add 2 oz Grain Alcohol to increase shelf life. How is the flavor? To sum it up in a word, amazing. The resulting grenadine is less sweet that my previous preferred recipe, but slightly less sour. I think this is likely a result of the fresh fruit in place of bottled juice. The hibiscus flowers really do add a floral note to this end product and the color is also enriched. However, I must admit, the color is really not that much deeper than that of the previous recipe I whipped up. If you’re going to be making a batch of homemade grenadine on your own I’d say go for the hibiscus grenadine. The flavor is less sweet which allows you to add a little more to cocktails without overwhelming the other ingredients and the floral notes are great. What beautiful pictures! 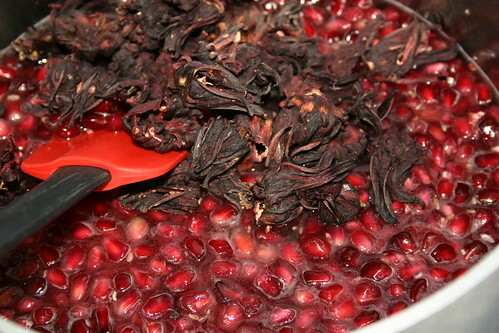 i`m very pleased to see that you got the inspiration to make this hibiscus grenadine because it surely is amazing!